As a normal person you’d probably be happy with how Razor template files are used within MVC; there’s a nice convention for where they live – they’ll be in a Views folder within your project most likely – and you refer to them either by name or sometimes just by convention – what’s that? You have an ActionResult method called “Index”? I’ll go fetch the “Index” view from the folders I normally expect the cshtml files to live in for ya then. The way this works is fantastic; development can steam ahead without the pain and confusion of all of the possible ways you could do it wrong when choosing webforms and .aspx files. Of course, the MS implementation of an MVC framework in itself is a wonderful thing; all but enforcing the separation of concerns that is just so easy to ignore in webforms. But what about when you want to dynamically generate html without a process being hosted as a website? One big use case for this is email generation; sure, you could host an MVC web API and have the content generation process constantly call it, but that seems a little inefficient. There’s a short stackoverflow answer comparing them (and RazorTemplates, another similar OSS solution) too. If you want to run this outside of Visual Studio, you can just run the compiled exe (bin/debug) as admin. If you’re using a test runner then you might be fine as is. I can’t actually remember the issue I was having as I now can’t recreate it, but I think it might have been around using dynamic models and Json decoding. I’m not going to go into the details of either RazorMachine or RazorEngine; there’s plenty of documentation up on their respective websites already. I’ve used @Includes in the examples above due to its simplicity; the libraries have differing support for things like @Html.Partial and also can be extended. Unfortunately, the html helpers (like @Html.Partial) need to have an HttpContext and run inside of ASP.Net MVC; which is what I’m trying to avoid for now. If you pull down my initial teeny solution from github and look at the tests you’ll notice the content of the template, layout, and model are either strings or coming from the filesystem; not related to the structure of the project or files in the project or anything like that. This means we can deploy a rendering process that returns rendered html based on strings being passed to it. Let’s play with this concept a bit more. Say you wanted to “host” a website directly within a CDN/cache, thus avoiding the hosting via the normal route of servers and related infrastructure. Sure, writing flat html in a text editor is a solution, but what if you wanted to still be able to structure your pages into common modules, write C# code to manage the logic to dynamically combine them, and use Razor syntax and views for defining the front end? This next section plays on this concept a bit more; we’ll write a small app that accesses a couple of directories – one for Razor files, one for data files – and generates a flat website into a third directory. I will then expand on this concept over a series of posts, to make something more realistic and potentially useful. The various FileSystemXX implementations either just read or write files from/to the file system. Natch. So what we’ve got here is an implementation of the RazorEngine methods I pasted in above wrapped in a RenderHtmlPage class, being called for a number of “productIds”; these happen to exist as json files on disc, e.g. “1.json”. 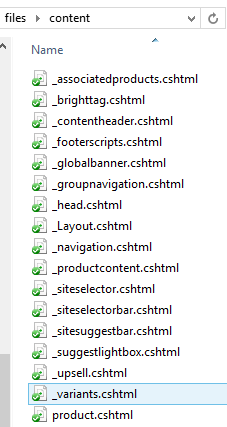 Each file is being combined with whatever Razor templates are listed in the product cshtml file and its referenced @Includes. The resulting html is then saved back to the file system. Hopefully you can see where this is leading; we can keep Views in one place, get the model data from somewhere else, and have the extremely generic rendering logic in another place. With this initial version we could take an existing ASP.Net MVC website (assuming it didn’t use any html helpers in the views..) and process it offline with a known dataset to create a readonly version of the website, ready to serve from a filesystem. I’ll take this concept and run with it across various implementations, gradually ending up on something that might even be useful!